ZION NATIONAL PARK — As Zion grapples with the challenges of increased visitation, which will exceed 4 million people this year, officials are having to answer some hard questions. Not least of these is evaluating the park’s carrying capacity and trying to decide if they will have to limit the number of visitors to part or all of the park to improve the experience for others. Zion’s Chief of Commercial Services and Partnerships Jack Burns has said park officials don’t know yet if they will be forced to put a cap on visitor numbers, and if so, park administrators don’t know exactly how they will go about it. Even the type of visitor has to be taken into account; some international visitors don’t view Zion as being too crowded because they don’t see crowding the same way Americans do, so the park must find a balance. That is why the park is developing a visitor use management plan with its main focus being determination of the capacity of the most-visited area of the park, Zion Canyon, because any visitor management there will have a ripple effect on visitation in other areas of the park. There are many options, Burns said. Many people are dead-set against visitor limitation, but others are advocates of the potential measure. Michael Plyler, executive director of the Zion Canyon Field Institute, said he falls into the latter category. People won’t like visitor limitations, Plyler said, but it needs to be done. He agreed with park management in saying that Zion Canyon has a carrying capacity. He compared it to a ticket to a rock concert – when tickets are sold out, no one else is let in. Plyler said he applauds park management for seeking public input and does not think any one voice in the visitor use management plan process will have most of the sway. Focusing the discussion on just parking and shuttles is not the complete answer to the dilemma, Plyler said. “The problem now is too many people,” he said. Zion’s in-park shuttles are already running at five-minute intervals, Plyler said. Of the respondents of a survey done for the St. George News summer series “Zion National Park traffic jam,” 64.2 percent said limiting visitors was extremely unacceptable (19) or unacceptable (45.2). Only 23.8 percent said limiting visitors was extremely acceptable (7.1) or acceptable (16.7). Many visitors opposed to setting limits believe the practice goes against the nature of a national park. It could also make it more difficult for those who want to go on the spur of the moment, like locals. One respondent, Jennie Adams, of Hurricane, saw visitor limitations as a double-edged sword. Colin Hunsaker, a native Utahn currently living in Southaven, Mississippi, had another take. 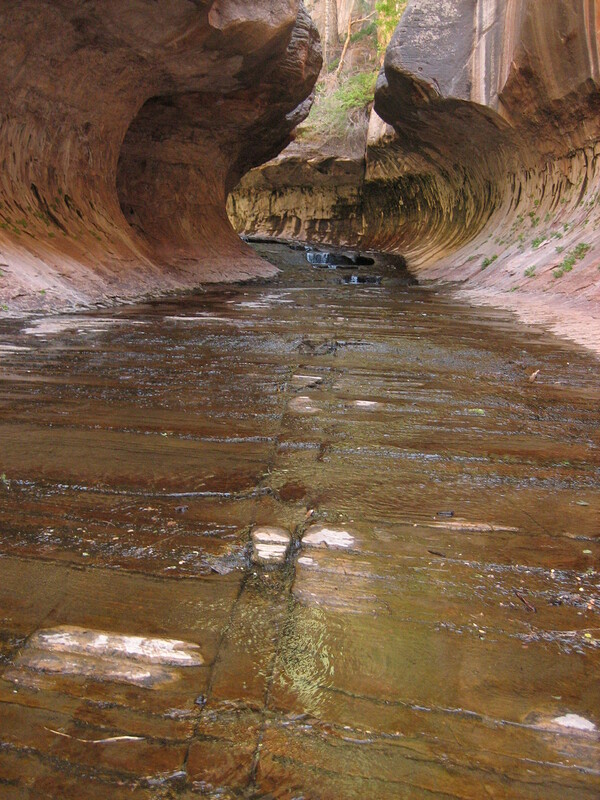 A permit lottery system similar to ones implemented for popular backcountry destinations such as the Subway and Mystery canyons is a way visitors could preplan a trip and not expect as many visitors surrounding them. It could be a plausible solution to limiting visitors in high-traffic areas such as Angels Landing and the Temple of Sinawava, Plyler said. These permit limitations have made the Subway and Mystery canyon hikes a more exclusive experience because they are an excellent way to get away from the crowds. With the lottery system, these places offer the solitude in a hike that many visitors are seeking. 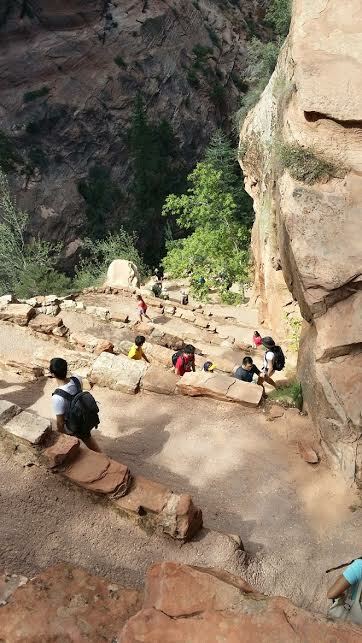 One major reason such limitations would be considered for other areas is just that – crowds – especially at Angels Landing, where too many people on its sometimes precarious trail leads to safety issues. 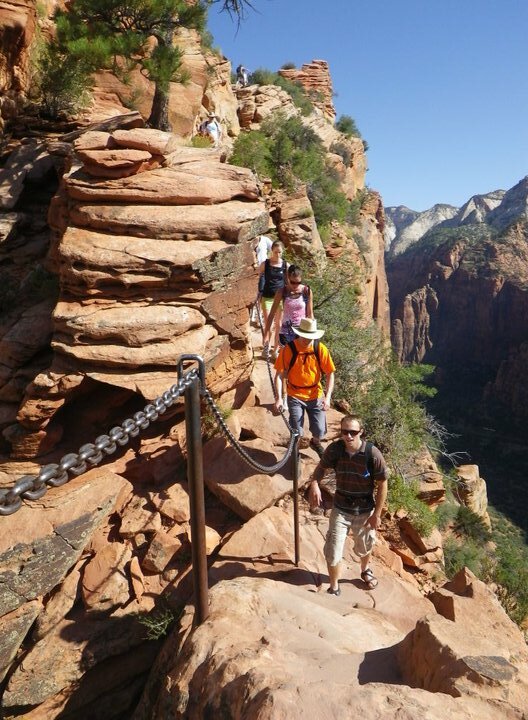 Another option for such high-use trails like Angels Landing and the Temple of Sinawava might be a timed entry or reservation system in order to address safety and health concerns and to ensure visitors have an excellent experience. Just as visitors had to get used to the Zion shuttle system, planning to bring lunches and hiking necessities on the shuttle with them, if a limitation is set, visitors will have to get used to knowing that they must preplan if they want to actually see the national park of their choice. One way to remedy the situation is for visitors to be aware of the busiest times, Burns said, and plan trips accordingly; this includes both time of year and time of day. The “shoulder seasons” that have traditionally been less crowded are shrinking as visitation increases. November and February have been busier recently than past years, and March is crowded due to Spring Break. The hours from 10 a.m. to 2 p.m. and 6-8 p.m. are also busy, Burns said. Visitors that come early enjoy relative solitude and are able find a parking space. Also, while Zion Canyon is the most popular area, there are other places to visit and recreate in the park. “The vast majority go into Zion Canyon to do the iconic hikes,” Burns said. The east side of the park sees fewer people, and visitors can experience different types of recreation than are found in the main canyon, Burns said. He also encouraged visitors to see the Kolob Canyons section of the park, accessed via Exit 40 on Interstate 15. Visitors can get away from the crowds by exploring Kolob Terrace Road, but it has few facilities for visitors. One of the facilities there, Lava Point, offers a view unique from those one would see in Zion Canyon; it is also the trailhead of the West Rim Trail. Burns said it’s a delicate message. They’re not trying to shift the problem from Zion Canyon, he said, but they want visitors to realize there is more to the park to see and experience than just Zion Canyon. The public scoping process for the visitor use management plan will begin in October. The process will include presentations of proposed actions and alternative management strategies. The goal of the process is to hear public comment as the park comes closer to a decision on its carrying capacity and what to do about it. “We want folks to understand that a proposed action is not a preferred action,” Burns said. In addition to Zion Canyon, public scoping will also look at what can be done in other areas, even East Zion and Kolob Canyons. Scoping sessions will be heldin Springdale, St. George, Kanab and Cedar City, and virtual listening sessions are a possibility. “The proposed action and management strategies will be made available to the public once the scoping sessions have been announced,” Burns said. “The announcement will be via a news release and by using our interested party mailing list. Once that has been done the proposed action and management strategies will be posted on a website the park has dedicated to information about the visitor use management plan. One price for US citizens and another for all others.